Pictured below is the RePower 5MW wind turbine generator, which at the time this article was first published (in late 2006) and for a while afterwards was the world’s largest wind turbine generator. 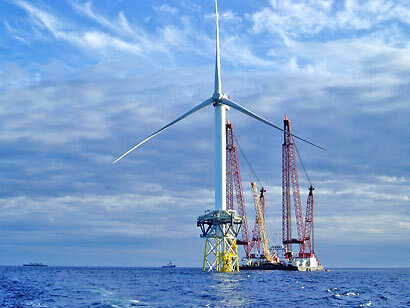 (Scroll down for details of the current – January 2014 world’s largest 7.5MW turbine). This RePower 5MW was installed in the North Sea 15 miles off the East coast of Scotland near the Beatrice Oil Field for testing. This was actually the first time these enormous offshore wind turbines were actually tested offshore, and the first time any wind turbine generator had been assembled in such deep water – 44 metres deep. Assembly took place in August 2006. Similar prototype turbines had been in operation since 2004 in Brunsbüttel, Germany requiring a 1,300 cubic metre concrete foundation constructed of forty 24 metre long concrete piles and 180 tons of steel. A further two 5M offshore wind turbines were subsequently (December 2006) erected on the DEWI-OCC test field in Cuxhaven, Germany, and taken into operation. The Cuxhaven site is near to a North Sea dyke and so offers similar wind conditions to those found offshore. The German RePower turbines have a power output of 5 Megawatts with a rotor blade diameter of 126 metres sweeping an area of over 12,000 square metres. Maximum power output is achieved at around 30 mph, but a couple of MW are generated even in a fresh breeze. Rotors start turning at around 7 mph, and are automatically braked at 70mph. Power control is achieved by blade pitching – i.e. turning the rotor blades individually out of very strong wind to prevent the whole structure being damaged. Find out more about power control with our guide to wind turbine furling. Such large wind turbine generators are ideally suited to the offshore environment thanks to high consistent wind speeds and minimal turbulence. According to historical measures of wind speeds at the Beatrice offshore location, it was expected that the turbines would run an impressive 96% of the time (8440 hours per year), and at 5MW full power 38% of the time (3300 hours per year). Back in 2006, 5MW was enormous. But technology has moved on, and at the time of updating this article (January 2014) the largest operational wind turbine generators in the world are rated at 7.6MW. This is the Enercon E-126 7.6MW which despite its size is actually designed for the onshore market. Since 2007 Enercon E-126 has been the largest and most powerful wind turbine in the world. Starting off with a rating of 6MW, improvements have been made over the last few years which have resulted in their current 7.6MW rating. This monster has a 135 metre tall tower, a 126 metre (hence the name E-126) diameter rotor, and reaches a total height of just under 200 metres. Pictured above is a wind farm made up of eleven of these 7.5MW E-126 turbines in Estinnes, Belgium. Construction was completed in 2010. 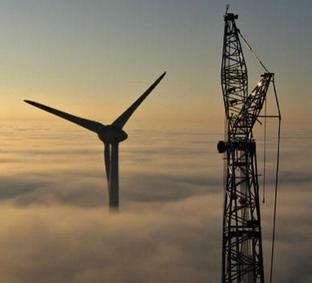 These turbines are also installed in The Netherlands, France, Austria, and Sweden. Click here to view the full technical data for this wind turbine on the official Enercon website: E-126. Multiple companies are currently working on the next generation of super sized wind turbines with at least five companies developing 10MW wind turbines.